God is on the move. Just when the enemy thinks he has gotten away with anything–suddenly, he is caught in his own web of destruction. Satan entered the heart of Judas and betrayed Jesus–but the blood of Jesus was salvation for all mankind. Don’t give up in the waiting on whatever YOU are facing or walking through! If you are sick, cry out and call on Jehovah Rapha –GOD OUR HEALER. If you need provision, cry out to Jehovah Jireh-GOD our provider. If you feel surrounded with despair, cry out to GOD Jehovah Sabaoth–”THE LORD OF HOSTS”….angels are on the way! The spoken Word of GOD cannot return void! Stop praying weak prayers. Get in the WORD OF GOD and get the WORD OF GOD in you. Let His Word wash over you! Prayers that rise up out of the Word of God and are soaked in the WORD move heaven to earth. Thank GOD for Jesus and the Mercy Seat…where the blood flows from Heaven to earth for ALL who will cry out to Jesus. Rest in His goodness! His Word is a lamp unto my feet, and a light unto my path…Psalm 119:105. The LORD watches over His Word. 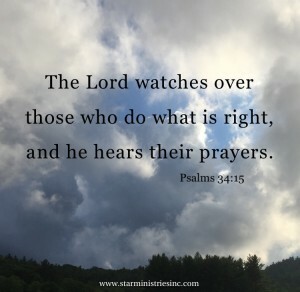 The LORD watches over those who do what is right, and he hears their prayers (Psalm 34:15). Don’t miss our first CROSS TOUR conference, November 9-10 at the Hilton Garden Inn, Concord, NC, Friday night 6:30PM-9:30Pm and Saturday 9AM-5PM. You don’t want to miss this conference. For tickets, go to Dr. Deborah Starczewski facebook page and scroll down to events: CROSS TOUR for tickets and more information. All tickets non-refundable. God bless you! GOD’S PRICELESS TREASURE (How To Overcome Challenges, Be Transformed and Know Your Purpose)…learn how to move from drama to destiny, from pain to purpose, from a mess to a message, and from trials to triumph through turning to Jesus Christ. Published by Charisma Creation House Press – 2011. A LEAP OF FAITH (25 Days At The Mercy Seat)….you won’t be able to put this book down. An amazing account of God’s divine intervention and how the Holy Spirit leads anyone who will turn aside to listen.